Alan W. Cramb is the ninth president of Illinois Institute of Technology. A member of the National Academy of Engineering, he received his B.S. in metallurgy from the University of Strathclyde (Glasgow, Scotland) in 1975 and his Ph.D. in materials science from the University of Pennsylvania in 1979. He then spent seven years conducting and managing research within the steel industry. In 1986 he joined the faculty of the Materials Science and Engineering Department at Carnegie Mellon University (CMU). In 1990, he became the co-director of the Center for Iron and Steelmaking Research and helped transition the organization from a local to a fully international center with a worldwide membership. In 1997 he was awarded the Posco Chair at CMU, and in 2000 he became head of the Materials Science and Engineering Department. 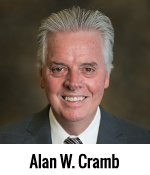 Cramb was appointed dean of engineering and the John A. Clark and Edward T. Crossan Professor of Engineering at Rensselaer Polytechnic Institute in 2005. His responsibilities included oversight of current and future initiatives in research and education for one of the leading engineering schools in the U.S. He joined Illinois Institute of Technology as provost in 2008. He is the holder of two patents and the author of more than 200 publications. He was the recipient of the American Iron and Steel Institute Medal in 1985 and 1986, the Robert Woolston Hunt Silver Medal of the Iron and Steel Society (Association for Iron & Steel Technology, AIST/ISS) in 1987, and was awarded the Benjamin Richard Teare Teaching Award at CMU for excellence in engineering education in 1995. In 2000 he was elected president of the Iron and Steel Society. He was named the John Elliott lecturer of The Minerals, Metals & Materials Society/ISS in 2002, and in 2003 was awarded the Benjamin F. Fairless Award of the American Institute of Mining, Metallurgical, and Petroleum Engineers (AIME). He became president of AIME, was chairman of the University Materials Council, and became a board member of the Accreditation Board for Engineering and Technology (ABET) in 2005. In 2007 he gave the Henry Marion Howe lecture of AIME/AIST and in 2012, the J. Keith Brimacombe Memorial Lecture of AIST. He is a distinguished member or fellow of AIST, AIME, ASM International, the American Association for the Advancement of Science, the Iron and Steel Institute of Japan--and was elected to the National Academy of Engineering in 2014. In 2016 he was awarded the Bessemer Gold Medal by the Institute of Materials, Minerals and Mining and inducted as a fellow into the National Academy of Inventors.